NOTE:Please check our size reference.PLEASE MEASURE YOUR KID'S FOOT LENGTH BEFORE BIDDING.THANKS. 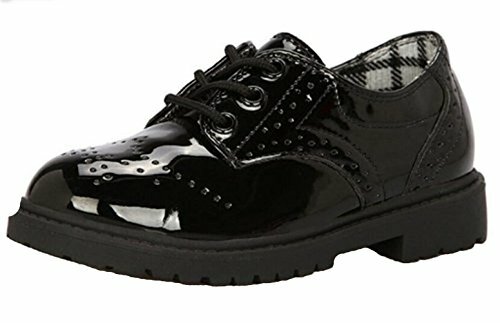 WUIWUIYU boy's girl's oxford formal lace-up shoes,good quality patent leather upside,keep always fashion.Non-slip soles,protect your child's feet very well.Suitable for various occasions:school,party,performance,wedding...The special shoes for your special kid,your best choice. Any other questions,please feel free to let us know.Thanks for your shopping. NOTE:Please check our size reference.Please Measure Your Kid Foot Length Before Bidding.If you baby feet is a little wide or fat,we recommend one size bigger.Thank you. Lightweight and breathable style,good match also. If you have any questions about this product by WUIWUIYU, contact us by completing and submitting the form below. If you are looking for a specif part number, please include it with your message.